Buy a MN or WI home with as little as $1,000 down? Yes, it is possible. Minneapolis, MN: One of the biggest true hurdles to home ownership is a lack of down payment money. Sadly, many people don’t even apply for a home loan, because they think you need a much bigger down payment than you actually may. You may qualify for down payment assistance. Apply to find out. But, if you have at least $1,000 of your own money, OK or better credit (640 score or higher), you may be able to buy your own home using our first time home buyer programs with down payment assistance. No down payment USDA Rural development loans. If you are in MN, WI, SD, or FL – Simply complete the secure online application at www.FirstTimeHomeBuyer-MN.com in about 10 minutes time. A fully licensed and experienced Loan Officer will review your loan application, then go over the various program to see what programs you qualify for, how much house you can buy, what the payments might look like, and finally, how much cash you may, or may not need to put it all together. If you are in other states, simply find a LOCAL mortgage broker, and apply with them. You have nothing to lose in applying, and everything to gain in owning your own home! Joe Metzler is a Senior Mortgage Loan Officer for Minnesota based Mortgages Unlimited. He was named the 2014 Minnesota Loan Officer of the Year, and Top 300 Loan Officers in the Nation for 2010, 2015, 2016. To finance with a home with Joe and Mortgages Unlimited, your local preferred lender for Minnesota, Wisconsin, and South Dakota, simply call (651) 552-3681 or APPLY ONLINE. NMLS 274132. Equal Housing Lender. Not everyone will qualify. See web site for more details. Not an offer to enter into an interest rate lock agreement. Student Loans and Mortgage Approval. What are the guidelines? Minneapolis, MN: Student loan debt is at an all time high, and has been noted as a contributing factor to why may people have been unable to purchase a home, especially first time home buyers. Recent changes to Fannie Mae and Freddie Mac guidelines have made it easier for some, but not all with student loan debt to still qualify for home mortgage loans. Fannie Mae and Freddie Mac do not do home loans. Rather they buy loans from lenders after that fact. Both Fannie and Freddie have set underwriting guidelines that if lenders follow, makes the selling of loans to Fannie Mae and Freddie Mac much easier. While the number moves, at any given time, Fannie Mae and Freddie Mac control +/- about 60% of all home loans. Student Loans. How do lenders calculate? Student loans can be in active repayment, some sort of reduced repayment (which is typically an income based repayment), or completely deferred. While a student loan may be deferred for the next year or two, your mortgage loan is typically a 30-year loan. It only makes sense that lenders take current or future student loan payments into consideration when calculating debt ratios and affordability. To avoid confusion, I’ll just talk about current guidelines for how lenders currently deal with your student loan debt for debt-to-income ratio purposes. These guidelines are current as of this article (Dec 1, 2017 (updated)). FHA loans must use the greater of 1% of the outstanding balance, or the payment listed on the credit report, unless you can document the payment is a fully amortizing payment. No income based repayment, graduated payments, or interest only payments allowed. For deferred loans, must use 1% of the outstanding balance. For loans currently in repayment, use the payment listed on the credit report. If payment is listed as $0.00, but $0.00 is an active income based repayment, we must verify with the student loan company that $0.00 is the income based repayment. For loans in repayment, use the amount listed on the credit report, or at least .50% (1/2%) of the outstanding balance, whichever is greater. For deferred loans, must use the amount listed on the credit report, or 1% of the outstanding balance as reported on the credit report. For USDA loans, if the loan is deferred, income based payment, graduated payment, or interest only payment, must use the greater of 1% of the outstanding balance, or the amount listed on the credit report. For VA loans, if payment is deferred at least 12 months past the loan closing date, no payment need be listed. b) The payment listed on the credit report if the payment is higher than calculated under (a). If payment on credit report is less than (a), a letter, dated within the last 60-days directly from the student loan company that reflects the actual loan terms and payment information is required to use the smaller payment. These updated guidelines primarily help those currently in repayment, but with income based, graduated payment, and interest only payment student loans obtain conventional loans. 3% down mortgages for first time home buyers. Just 3% DOWN PAYMENT MORTGAGES for First Time Home Buyers. Minneapolis, MN: Lack of down payment money is the biggest hurdle for most first time home buyers. We eliminate that hurdle here at Mortgages Unlimited for low and moderate income buyers in MN, WI, and SD with the HomeReady Mortgage from Fannie Mae (R). Ideal for first-time homebuyers, millennials, and low- to moderate income borrowers. Flexible sources of funds for a down payment, including gifts and grants. Income limits as high as 170% of area medium income – no limits in underserved areas. Mortgage Insurance drops off automatically at 80%, unlike FHA loans, which stays forever. Not every mortgage loan is right for every person or situation. We’ll review your application to determine if this, or some other program works best for you. There is never any obligation to review your mortgage loan options. Everyone knows it is smart to get lender Pre-Approved before starting to look for a home, yet many people are actively looking at homes thinking they are Pre-Approved, when in reality, they are only Pre-Qualified. Pre-Approved or Pre-Qualified? So what is the difference? They NEVER supplied the lender with all (or even any) basic supporting documents up front. Simply put, if you didn’t supply current pay stubs, bank statements, W2’s, and Tax returns, YOU ARE NOT PRE-APPROVED – No matter what they tell you! Looking to buy a home in Minnesota, Wisconsin, or South Dakota? Don’t have your dream fall apart at the last minute, get properly Pre-Approved for a home loan today. Minneapolis, MN: Buying a home for most people is the largest financial transaction of your life. Finding the Best Mortgage Loan Officer that is licensed, educated, experienced, professional and ethical is probably the most important decision you’ll make next to actually picking out that perfect dream home. First, understand that the mortgage company or bank that you choose in most cases has little to do with the success of your transaction. Essentially all mortgage lenders have and offer the same basic programs with the same underwriting guidelines. FHA loans for example are FHA loans no matter who you call, so in most cases, there is nothing special that one lender has over another. Yet for others, there can be some differences, especially if you are on the edges in terms of loan approval. For example, a big bank with the stagecoach in their logo will not offer FHA loans over a 45% debt ratio, while some mortgage brokers (like us) will go to 50% debt-in-income ratio. This is a good example of why a mortgage broker may be a better choice, as they offer the products of multiple lenders, as opposed to just their own. Using this one example, you may have lost out on your dream home simply because you chose the wrong lender. All mortgage Loan Officers must have a tracking / registration number known as an NMLS number. But having this number does NOT mean the Loan officer is licensed, or experienced. Loan Officers at banks, credit unions, or mortgage lenders owned by a bank or credit unions can be, but are NOT required to be licensed in any way. Loan Officers at non-bank mortgage companies or brokers ARE REQUIRED to have an individual mortgage license. You can check if your Loan officer is simply registered, or fully licensed by searching them on this public web site: www.NMLSconsumerAccess.org. At the bottom of the page, under licenses and registrations, there will either be one or more states listed, which means the person is licensed. If it indicates something similar to “Federal National Mortgage Originator”, this is a fancy name that means they are NOT licensed. Being licensed versus simply registered does not automatically indicate if a Loan Officer is a good choice or not, but if one was doing the largest financial transaction of their life, I’d probably lien towards someone who has had to take schooling, pass state and federal testing, and is required to complete continuing education each year to be licensed, versus someone who didn’t have to do any of those things to simply be registered. Heck, even your hairdresser needs a license! Using this example, you may have lost out on your dream home because of the the unlicensed, and inexperienced Loan Officer you chose. Not only do most lenders only offer the same underlying loan products as everyone else (Fannie Mae, Freddie Mac, FHA Loans, VA Loans, USDA Loans), but they all have the same underlying closing costs, get the money to lend you from the same source, and interest rates are based on the same bond market everyday. This is why you’ll notice all standard rate quotes are almost identical. This is why you’ll notice all closing costs quotes are almost identical. 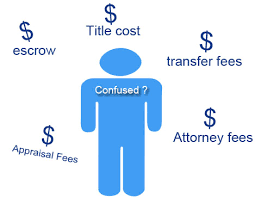 All lenders have the same actual closing costs; appraisal, credit report, state deed taxes, county recording fees, title company charges, underwriting, origination fees, etc. However, how lenders charge them to you can vary, and this is tied directly to your interest rate. For example, assume your shopping, and one lender says your closing costs are $5,000, and the next says $3,500. The lower price sounds good, and that would be true if the rates were the same. But they almost never will be. Advertising and buildings are expensive. The previously mentioned “Quick” lender for example advertises all day everyday on all TV channels, and radio stations all across the country. You can’t go anywhere on the internet without seeing one of their advertisements. How much does all that cost? Must be millions. You are foolih to think that higher cost isn’t passed along to you in terms of the interest rate they charge you. Sames with the big lenders with branches everywhere, and paying hundreds of millions for stadium naming rights. Lender credits towards your closing cost is a tool lender use to lower your out-of-pocket closing costs up-front by slightly increasing your interest rate. By doing this, the lender requires less initially because they make it up by collecting more in interest over time. Some lenders start right out of the gate by saying they don’t charge origination, or maybe they will pretend to pay for things like your appraisal. Someone is paying those items, and it is always you. Now there is nothing wrong with taking a slightly higher rate to lower costs today. We do it all the time. But just understand that you are still paying for those costs, just in a different way. Look at this 30-yr fixed screen shot from today for a $200,000 loan. At 3.875%, lender would charge $750 in discount points to “buy” this lower rate, but at 4,125%, lenders would reduce your closing costs with a lender credit of $2,250. The monthly payment difference between the two rates is $29.00. There is nothing an internet lender can offer you that the local mortgage lender down the street can’t offer. They do not have lower rates, they do not have lower closing costs. But there are many things the internet lender can’t offer. One big item is local knowledge, and dedication to the community. Some kid working in a cube in Detroit, MI could care less about my back yard or Minneapolis, St Paul, MN. I constantly get phone calls from people who started a mortgage application with a big internet lender, who is “Quick In” mortgage. They complain about high pressure sales, lack of product knowledge, mandatory up-front fees, failed closings, and more. I also get a lot of calls from people who filled out an inquiry form at places that “Lend from a Tree”. Funny and cute commercials about applying in your underwear, but this place isn’t even the lender. Rather, they take your name, then sell it to as many real lenders as possible for around $40 a lead. You are then inundated with calls from all these lenders trying to one up the other with false and misleading promises to get you to use them. Big out-state internet lenders also NEVER have the ability to offer any state of local first time home buyer, or down payment assistance programs. Using this example, you may have lost out on your dream home because you picked an out-state internet lender who doesn’t offer all the loan products available in your area. In theory, a Real Estate Agent referral to a Loan officer should be something of value, but not always. This is essentially because there are two underlying types of referrals. A referral because the Real Estate Agent has worked with the Loan Officer for a long time, and knows them to be a licensed, knowledgeable, experienced mortgage professional looking out for your best interests. This is a good referral. A referral because the Loan Officer works for the same company, or otherwise is heavily influenced by the owners of the Real Estate Company to refer to a specific lender or internal Loan Officer simply because it makes someone else money regardless of the qualify of the Loan Officer. While not automatically bad, the second type of referral is highly suspicious. Tips to this type of referral are that the Loan Officer works for the same company, they share office space, or if you have already told your Real Estate Agent you have a lender you are happy with, and they become pushy or start talking negatively about your choice to get you to go to their choice. As you can see, your Loan Officer choice is important. Ask questions, get answers. Just because someone refers, they advertise a lot, or appear to be quoting a super low rate or closing cost doesn’t mean they are the best for you, or that you shouldn’t shop or get a second opinion. Take the time to pick a great lender, just as you take the time to pick the perfect house. Mortgage loans. Why all the paperwork? Mortgage loans – Why all the paperwork? Minneapolis, MN: Getting a mortgage loan? Prepare to supply your Loan Officer with photo ID, your last 30-days of pay stubs, last two years W2’s, tax returns, last two months bank statements, divorce papers, and maybe even more. Then once you supply those documents, be prepared to answer question like: prove where that large non-payroll deposit on you bank statement came from. As a Loan Officer serving Minnesota, Wisconsin, and South Dakota, I am constantly asked why is there so much paperwork required to get a mortgage loan today. It seems that the lender wants to know everything about you these days, and you would be correct. Your mortgage lender does want to know a lot about you. If you were to give a complete stranger a huge loan, for a 30-year commitment, what would YOU want to know about them? To make it feel worse than it really is, from about 1999 until 2007 during the housing boom, there were many programs available that allowed for limited documentation, or even no proof of income. Many people took advantage of those programs. Unfortunately, a large number of those people were allowed to bite off more loan than they would have been allowed if they proved income, contributing to the real estate collapse starting in 2007. No one wants foreclosures and bad loans. It isn’t good for the home buyer, the neighborhood, or the economy. For that reason, mortgage companies need to verify and double check everything on the application, and to make sure you are a good risk. There are three very good reasons that the loan process is much more onerous on today’s buyer than perhaps any time in history. The mortgage industry was a bit too trusting in the past. Lenders for example asked for a pay stub, but we took what you provided at face value, and there was no double check. This allowed fraud to become rampant. How hard would it be to scan a W2 that said you made $30,000 a year into a computer, then use Photoshop to change that the 3 to an 8, and now you make $80,000 a year income. Even without fraud, during the run-up in the housing market, many people qualified for mortgages that they realistically could never pay back. The government has mandated new guidelines that now demand that the mortgage lender prove beyond any doubt that you are indeed capable of affording the mortgage. The rule is called ATR, or the “Ability to Repay” rule. So no more stated income, or limited income loans. The lenders have never wanted to be in the real estate holding business. Since the collapse, lenders suffered huge losses that came close to destroying the economy, and were were forced to take on the responsibility of liquidating millions of foreclosures, and negotiating millions of more homes in short-sales. The friends and family who bought homes ten or twenty ago experienced a simpler mortgage application process. If you got a loan ten to 20-years ago, yes, it was easier. But at the same time, if you never experienced that in the past, your fame of reference is that it really isn’t all that difficult today. Instead of complaining about the paperwork required, be thankful that that you can get a loan, and get it at these amazingly low mortgage interest rates. Minneapolis, MN: Many people believe that if you call around to enough lenders, that you will find someone offering a great deal. The reality is that it doesn’t really work that way. We generally say that if you call around to enough lenders, you might find the biggest liar. Are All Lender Essentially The Same? First understand that for all your traditional loans; FHA, VA, Fannie Mae, and Freddie Mac loans, which encompass the vast majority of all mortgage loans done in this county, every mortgage lender follows the same rules, have the same underlying costs, and set rates based on the same thing. If my rates go up, so do theirs. If my rates go down, so do theirs. Ever notice that most of the time, when purchasing the same item at Target or Walmart, the price is virtually the same thing. Maybe just a tiny difference? The same thing goes with mortgage loans. Are there minor differences in mortgage companies rate? Yes, but generally, the difference between the best and the worst on any given day is about .25%, and really only has to do with overhead, not one being able to really offer something better. If my cost is the same as their costs, but they have to pay for advertising on all TV channels, radio stations, and all over the Internet. If they have to pay for stadium sponsorships, and the brink and mortar buildings on every corner, but I don’t… Who do you think can then offer better deals? Yes, it is that simple. Long term fixed rate loans, like Conventional fixed rate loans and Government back VA Loans and FHA Loan lenders all set their rates based on the pricing of Mortgage Backed Securities. These mortgage bonds are traded in real time, all day in the bond market. This means rates or loan fees (mortgage pricing) moves constantly throughout the day, being affected by a variety of economic or political events. The bond market most days trades in a small zone. So the mortgage rate the lender sets in the morning, is usually good all day long. But sometimes, the bond market has bigger changes though out the day, meaning a mortgage lender could potentially change rates during the day, sometimes even multiple times in one day. This can be very frustrating for mortgage shoppers. You call this morning to get a mortgage quote. Quote in have, you talk to your spouse about it, calling back in the afternoon, just to get a different quote. Sometimes this change is in your favor. Sometime it is not. Therefore tracking these securities in real-time is critical. When MBS pricing goes up, mortgage rates or pricing generally goes down. When they fall, mortgage pricing goes up. Click this link to track our live mortgage rates for MN, WI, and SD. Working with a mortgage loan officer who knows and understands the mortgage back security market, someone who can help you understand when to lock your interest rate, or if you should float your interest rate it critical. I am one of those Loan Officers, not just your typical Loan Application Clerk. I lend in MN, WI, and SD. Why get a VA Loan? It’s simple … Lower Rates. Lower Payments. $0 Down Payment. Thousands of people are using their VA Loan benefit every single month. Let us help you purchase a MN or WI home with ZERO DOWN, or lower your existing VA home loan with a refinance to today’s low interest rates. till allows a Vet buy a home with Zero DOWN and finance 100% of the home’s purchase price. Now more than ever, banks are requiring larger down payments for conventional loans with more expensive mortgage insurance. In many cases they require 10-20% down, putting home ownership out of reach for many prospective buyers. How much will $0 down save you? FHA loans require 3.5% down. Conventional loans will require a minimum of 5% down, and in many cases as much as 10% and 20%. A VA Loan offers a HUGE savings benefit. They do NOT require monthly PMI, or private mortgage insurance. PMI is an added monthly expense required for conventional loans and FHA loans where the borrower finances more than 80% of the home’s value. Interest rates are also typically lower with a VA Loan, than a conventional loan. A lower rate combined with monthly PMI savings can substantially lower your monthly payment. The qualification guidelines are less stringent for VA Loans. Because the loan is backed by the government, lenders don’t need to meet strict lending rules. VA Loans require no down payment, and have no mortgage insurance, plus you can roll all your closing costs into the loan. This makes for one heck of a great first-time home buyer deal for military veterans wanting to buy a home! The country appreciates your service. This is one way we pay you back. Today mortgage rates on VA loans are very low, making homes even more affordable. VA home loans do not require a down payment, unless the purchase price is more than the appraised value or in excess of current loan limits. VA home loans have limitations on which closing costs may be assessed to the veteran. VA home loans have no prepaid without penalty. Maximum (zero down) VA loan has increased to match conforming loans! VA interest rates are competitive with conventional loan interest rates. VA home loans do not require mortgage insurance – this is a HUGE savings. Although there is no down payment required – There are still closing costs, but the seller usually pays ALL of the veteran’s closing costs (and with a $0 down payment, the veteran can literally purchase a home for nothing). Senate bill S.1375, the “Rebuilding American Homeownership Act” has been introduced by Senator Jeff Merkley, D-OR to try and expand the existing HARP (Home Affordable Refinance Program”. This has been called by many as “HARP 3“, and is designed to allow loans not currently owned by Fannie Mae of Freddie Mac to be refinanced through the HARP program. Under the current HARP underwater refinance program, in order to qualify, your existing mortgage loan must be owned by Fannie Mae or Freddie Mac. If passed, the bill would force Fannie Mae and Freddie Mac to refinance non-Fannie Mae or Freddie Mac loans, and to price in the additional risk into the interest rate so that the program would not cost taxpayers anything. Merkley also introduced another bill that would encourage people to refinance into loans terms of less than 20-years, which builds equity faster, by paying $1,000 of underwater homeowners closing costs. Previous attempts at a HARP 3 program, or modifying the current HARP 2 program have not gain much traction in Washington, and these two new bills have no other sponsors. The Federal Housing Finance Agency (FHFA) special underwater refinance program, commonly known as HARP (Home Affordable Refinance Program) is still going strong. While mortgage rates have risen a bit, there are still millions of people who could take advantage of the program to save significant money on their monthly mortgage payments. Because of this, the FHFA had Fannie Mae and Freddie Mac extend the HARP program by two years to December 31, 2015. The program was originally set to expire December 31, 2013. More than 2.2 million homeowners have already refinanced through HARP since HARP was introduced by FHFA and the U.S. Department of the Treasury in April 2009. HARP is uniquely designed to allow borrowers who owe more than their home is worth the opportunity to refinance their mortgage.Extending the program will continue to provide borrowers opportunities to refinance, give clear guidance to lenders and reduce risk for Fannie Mae, Freddie Mac and taxpayers. In addition, FHFA will soon launch a nationwide campaign to inform homeowners about HARP. This campaign will educate consumers about HARP and its eligibility requirements and motivate them to explore their options and utilize HARP before the program ends. The loan must be owned or guaranteed by Fannie Mae or Freddie Mac. The current loan-to-value (LTV) ratio must be greater than 80 percent. late payment in the last 12 months. Minneapolis, MN: The Minnesota and Wisconsin housing market for homes under $250,000 is hot… Good homes priced well are selling very quickly, and usually above the original asking price. I’ve run into this situation many time recently when buying a HUD home, so I thought I would address it here. DOES MY BUYER HAVE TO USE HUD’S FHA APPRAISAL? The quick answer is YES if using an FHA loan to buy the house. NO if using any other financing. If you are buying a HUD foreclosure, they almost always already have a HUD Appraisal. This is good and bad. On the good side, if the buyer is using an FHA loan, the buyer does not need to pay for one of their own. They get to use the HUD appraisal. If the buyer is using any other type of financing, the existing HUD appraisal is meaningless. You will need a new one. But if the house goes into multiple offers, the buyers using FHA financing are hamstrung by the HUD Appraisal. Sure, they can offer more than the HUD appraisal, but any amount they offer above the asking appraisal amount will be additional cash out of their pocket above the standard FHA down payment of 3.5%. For example, a HUD Home is on the market for $100,000 with an existing HUD appraisal at $100,000. There are multiple offers. You want the house. You offer $105,000. Therefore your down payment is $8,675 (3.5% of $105,000 PLUS the $5,000 above the appraisal price). Many homeowners are curious about the appraised value of their home. An actual appraisal is expensive, and county tax records do NOT always reflect true market value. As you may be aware, home values are constantly fluctuating, and with the decline in average values, everyone has lost value. But things are changing, average home values the past 12 months in the Minneapolis / St Paul, MN area have risen on average 14.1%. So what your home is worth today? There are many sites that claim to give you are idea, including Zillow, Trulia, and more. It is also a well known fact those sites have very questionable data, giving values that range from close, to crazy far off. The big problem is, where is the data they use coming from and how accurate is it? While the estimate may not be the actual or appraised value of your property, this can be a much more useful too than Zillow to gauge fluctuations and trends in your market which affect your home’s value. The FHA Streamline Refinance program. No appraisal, no closing costs, easy qualifying, and even skip a month of payments. Minneapolis, MN: VA Home Loans In MN and WI are probably the coolest mortgage loan lenders offer. It is available both while serving our country and after they are discharged. Upon a veterans return, hey usually are looking to re-establish themselves the the communities that they will be returning to. This means that many of them will be looking to purchase a home that they can settle in and raise their families. A VA Mortgage can assist our Veterans in making that transition. VA Mortgages provide our Veterans with two major advantages that other Mortgage programs do not have. A VA Streamline Refinance is similar to the FHA Streamline Refinance. It is officially known as a IRRRL loan (interest rate reduction refinance loan) because of the money you can save by lowering your monthly interest rates. It was created by the VA in an effort help our veterans secure the lowest interest rate possible. This VA loan process is done quickly, with minimal hassle so our veterans can save immediately. Minneapolis, MN: Freddie Mac yesterday released the results of its Primary Mortgage Market Survey® (PMMS®), showing fixed mortgage rates moving higher following December’s employment report. The 30-year fixed averaged 3.40 percent, its highest reading in eight weeks. The all-time record low for the average 30-year fixed was 3.31 percent set November 21, 2012. 30-year fixed mortgage rates (FRM) averaged 3.40 percent with an average 0.7 point for the week ending January 10, 2013, up from last week when it averaged 3.34 percent. Last year at this time, the 30-year FRM averaged 3.89 percent. 15-year fixed mortgage rates this week averaged 2.66 percent with an average 0.7 point, up from last week when it averaged 2.64 percent. A year ago at this time, the 15-year FRM averaged 3.16 percent. 5-year adjustable mortgage rates (ARM) averaged 2.67 percent this week with an average 0.6 point, down from last week when it averaged 2.71 percent. A year ago, the 5-year ARM averaged 2.82 percent. Freddie Mac’s survey is the average of loans bought from lenders * last week, including discount points. Applicants must pay all closing costs at these rates. No cost loan rates higher. 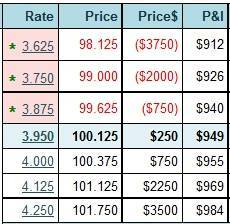 Follow this link to view today’s best MN and WI mortgage interest rates. Minneapolis, MN: Freddie Mac (OTC: FMCC) today released the results of its Primary Mortgage Market Survey® (PMMS®), showing average fixed mortgage rates edging slightly higher while remaining near their all-time record lows coming off the employment report for September. 30-year fixed-rate mortgages (FRM) averaged 3.39 percent with an average 0.7 point for the week ending October 11, 2012, up from last week when it averaged 3.36 percent. Last year at this time, the 30-year FRM averaged 4.12 percent. 15-year fixed rate mortgages this week averaged 2.70 percent with an average 0.6 point, up from last week when it averaged 2.69 percent. A year ago at this time, the 15-year FRM averaged 3.37 percent. 5-year adjustable-rate mortgages (ARM) averaged 2.73 percent this week with an average 0.6 point, up from last week when it averaged 2.72 percent. A year ago, the 5-year ARM averaged 3.06 percent. Especially if you are pre-approved with your Real Estate Agent's own company or a large bank. This is up to a $400 Savings Value! Click Appy banner to get started. What does it take to qualify for a home loan? What are mortgage loan closing costs, and why do I pay them? Millennials are not buying homes. Is this true or myth? DISCLAIMER: This information has been compiled and provided by MnRealEstateDaily.com as a service to the Real Estate Agents and homeowners. While our goal is to provide information that will help consumers understand mortgage loans and real estate issues, this information should not be considered legal advice. Such advice must be specific to the various circumstances of each person's situation, and the general information provided on these pages should not be used as a substitute for the advice of a Licensed Mortgage Professional, Licensed Real Estate Agent, or competent legal counsel. Not responsible for the actions of any person or company with links from this site. Joe Metzler, NMLS #274132. Mortgages Unlimited, NMLS #225504. © 2011 - 2019 Metzler Enterprises, LLC. All rights reserved.